Adrian Peterson's second fumble is negated by #Lions ' offsides penalty. AP should take those gloves off and hang on to the ball! 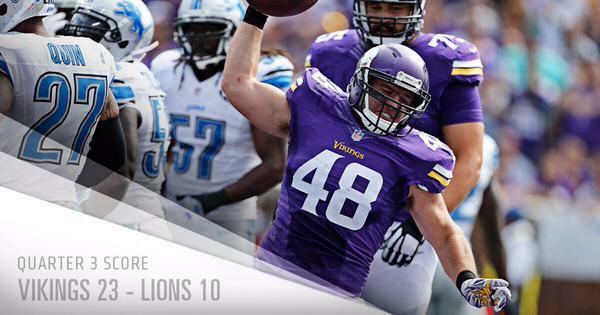 Michigan native @ZLINE48 finds the end zone from 1 yard out. Fantasy owners chew keyboards as Teddy Bridgewater and Zach Line have had rushing TDs in 2015 before Adrian Peterson.
.@ZLINE48 scores his 1st career NFL TD on 1-yard TD run. Line is an Oxford, Michigan native. #Vikings lead 23-10 with 8:54 in the 3rd Q.
Uh-oh! Might end up 24-23? Was there a gusty cross wind on that? 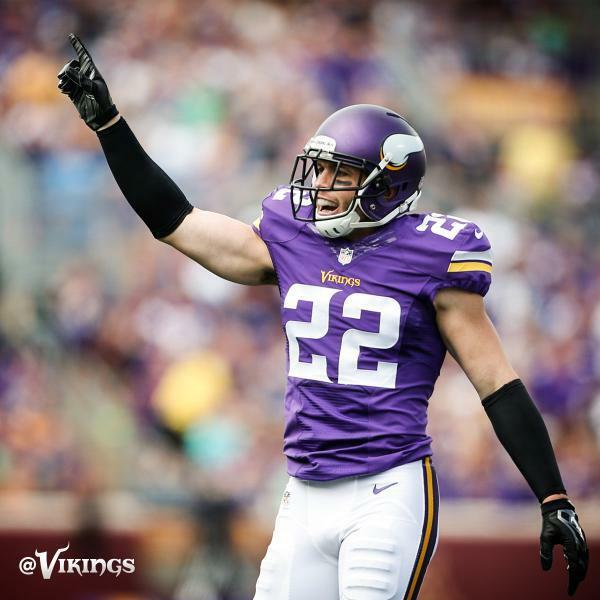 The #Vikings recover another DET fumble.
.@HarriSmith22 forces his 4th career fumble. DT Shamar Stephen recovers for his 1st career FR. Play is under reivew.
.@HarriSmith22 punched the ball out and DT Shamar Stephen scooped it up. Greasy pregame meal served to all RBs today! The #Vikings have forced 3 turnovers this season, all 3 fumbles (2 defensive, 1 special teams). Well, Matt Kalil is finishing plays. Second missed tackle for Eric Kendricks today, otherwise #Vikings have been much improved in that department. Reminder: @thesuperstar68 & I will open up #Vikings #VentLine on @1500ESPN IMMEDIATELY after the game. Harrison Smith leveled Stafford on that 1st down throw. Stafford has taken a beating today, but still no sacks. After #Vikings gave up 230 on ground in SF, Matthew Stafford is the #Lions ' leading rusher with 11 yards today. Is Everson Griffin doing anything today? #Lions S Don Carey is questionable to return with a foot injury. remind me again why charles johnson is ahead of Patterson? Coach Zimmer throws the red flag again to challenge the spot of the ball. The call on the field would force a #Vikings 4th down. Why aren't Vikings just feeding AP to close this one out. Seems to get 3-4 yards/ rush. The ruling on the field stands and @jefflocke18 comes on to punt.